What a cool dude! He's pink with blue sunglasses, a toothy grin, blue underwear and a sparkly red jersey with a cross on the front. 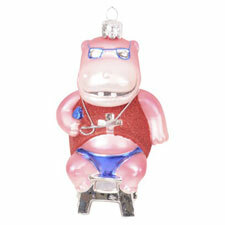 He perches on a silver chair and has a wire loop at the top for hanging from your Christmas tree or anywhere you like to keep your hippo collection. But hang him securely; he's made of blown glass and is fragile.